Dying without a will, well, to be truthful, can be ugly. Probate court, and feuding family members is not what most want for their families after their passing. Whether your spouse has passed on, or you just never married, or you have a partner, it really doesn’t matter – it’s always wise to write a will to make sure your belongings and assets are passed on appropriately. If you don’t appoint someone to manage your estate, it is possible that relative may step up to manage things – or perhaps a friend – or even a creditor in some cases. If no one steps up, any financial accounts will be turned over to the State of Arizona as unclaimed property after a certain number of years has past. If and when an heir discovers property being held by the State, that heir will have to go through certain procedures to claim the property. Other property like personal or real property, may just languish or be taken advantage of by others; real property may end up on State lists for property tax sales when taxes have remained delinquent over a number of years. If no one knows who your relatives are, it can be an added expense to your estate to try and locate those relatives, if there is any one who steps up to try and manage the estate. The Court will not try to find your heirs; some one else must request authority from the Court to take possession of the estate and to conduct an investigation to find them. 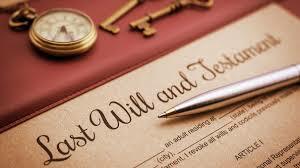 Believe it or not, more than 50 percent of people still don’t have a will. It seems obvious that most people just don’t think about it – or don’t want to think about it. They may still be young or perhaps they have never suffered an illness which often brings up our thoughts about immortality and our estate. Certain people never reach one of those obvious points in their lives to write one. If you are unmarried in middle age, do not have children and have never had a devastating disease or brush with death, making plans for what happens to your assets if you’re not around may not feel pressing. One day though, you may hit a certain age when you just say to yourself “Who’s going to take all this when I’m gone?” At some point the thought comes to mind. For most middle Americans, who don’t want to set up a trust plan, and just need to pass things on to a family member or loved one, it’s a simple process, but it should be well thought out. Will this person be a good steward of what I leave them, will they sell it or worse, throw it all away? All aspects should be considered. For a simple will in Arizona, click on our form finder to make sure you’re searching for the correct will to write for your circumstances.